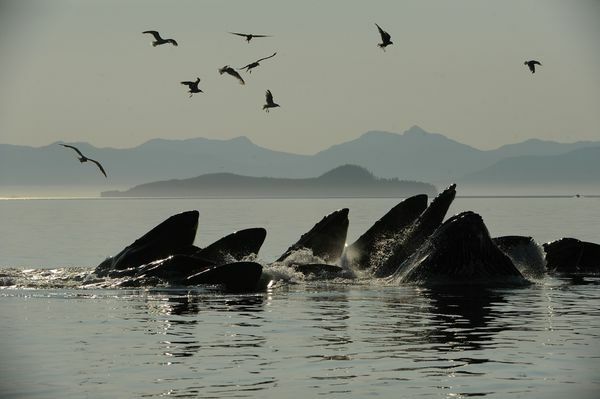 OFF KUPREANOF ISLAND — Frederick Sound in Southeast Alaska is a rich feeding ground for humpback whales. 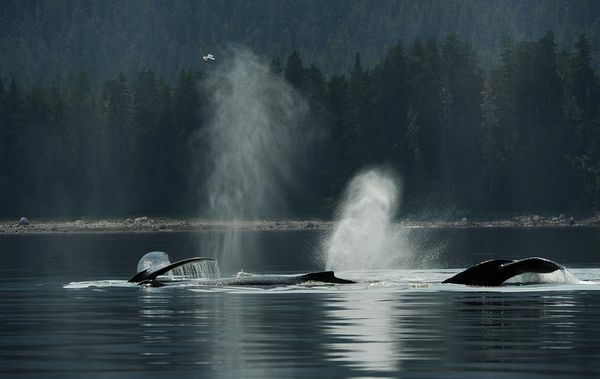 A pod of humpbacks was seen bubble-net feeding July 21 north of Petersburg. 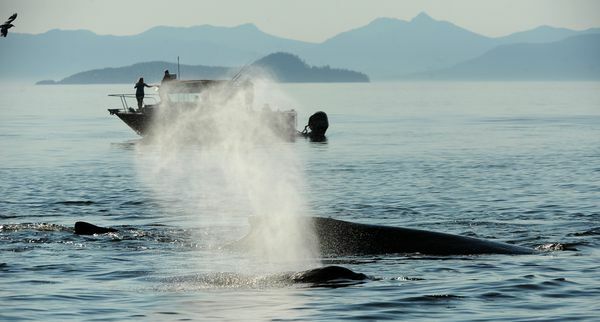 The whales dive and then expel a ring of bubbles. Small fish are trapped in the rising circular curtain of bubbles. The whales come up inside the circle of bubbles with mouths open, capturing the fish. The whales have 240 to 400 baleen plates hanging from the upper jaw that filter out the small fish as they force the water out. 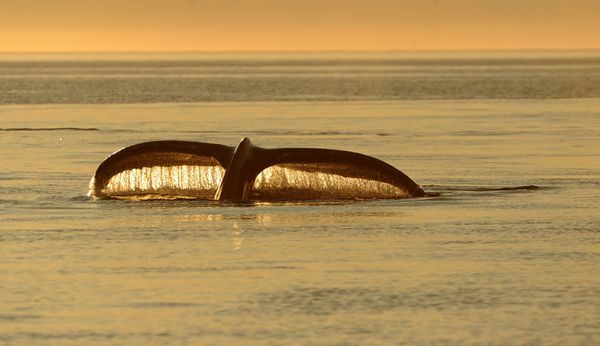 Humpbacks also feed on krill. 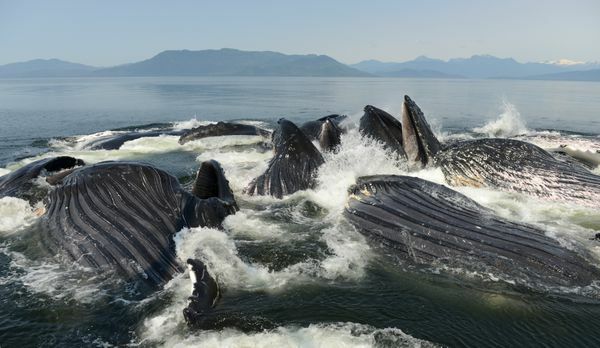 The whales migrate between Alaska and Hawaii, Mexico and near Japan. 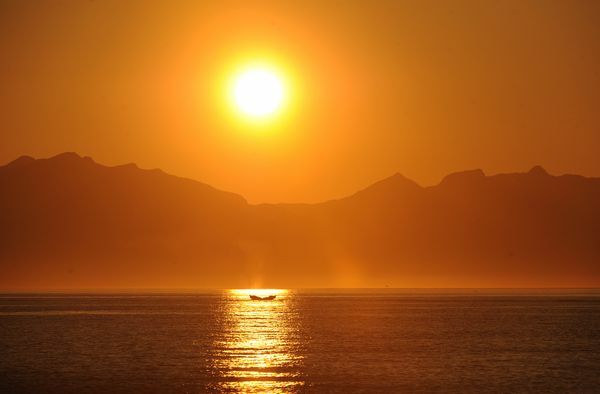 They rarely feed during migration or while in southern latitudes. The breeding season occurs while they are in their southern range, and females give birth 11.5 months later. 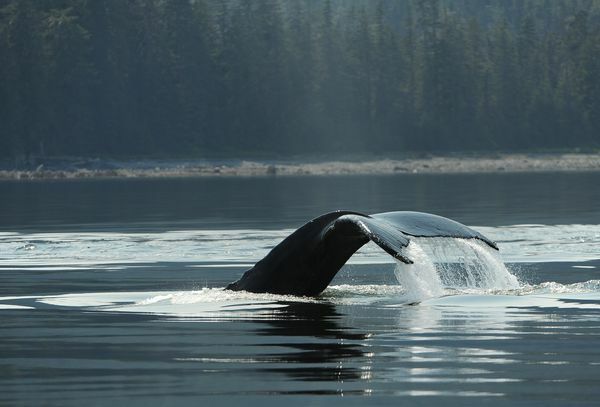 Humpback whales grow to 49 feet long and weigh 35 tons, with males being slightly smaller than females. They can live 40 to 50 years. 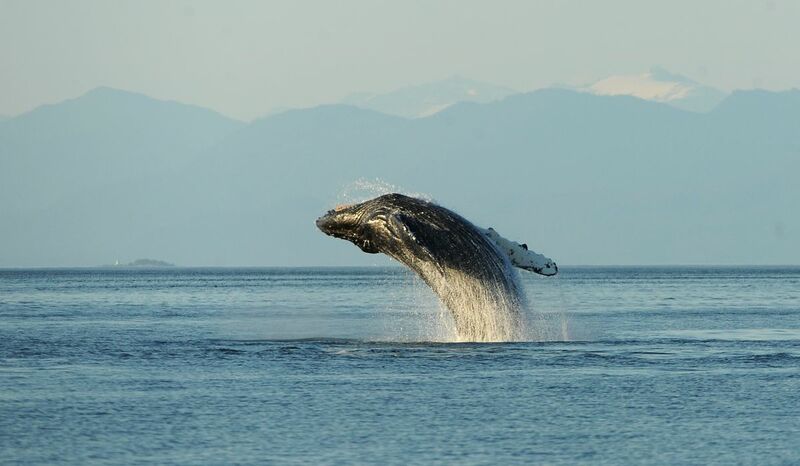 Humpbacks have long flippers that can be up to 30 percent of the body length. They sometimes slap the water with their flippers. 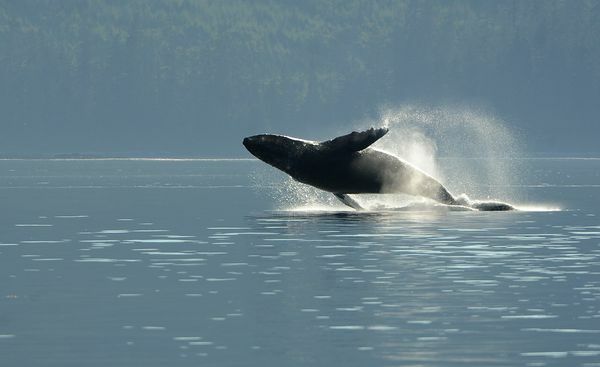 When whales breach, they power their 35 tons out of the water, sometimes completely out, and crash down on their sides, creating a boom and a huge splash. 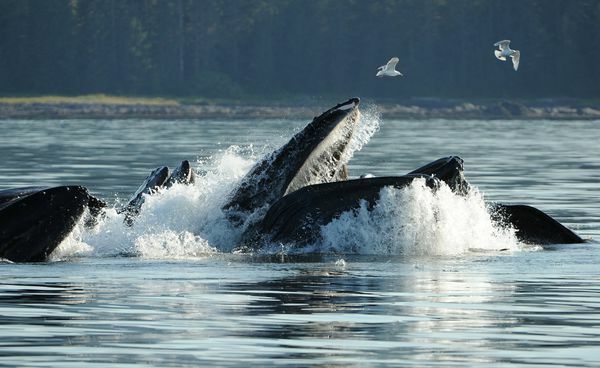 Humpbacks also slap their tails on the surface. Scientists are not sure why. 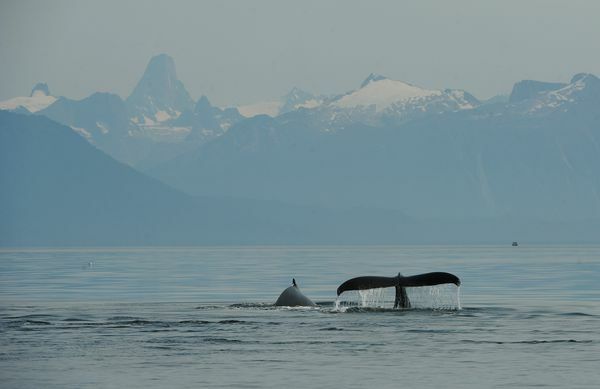 Humpbacks are commonly seen in Southeast Alaska, the Aleutians and in Southcentral waters between Kodiak and Prince William Sound, including Resurrection Bay. 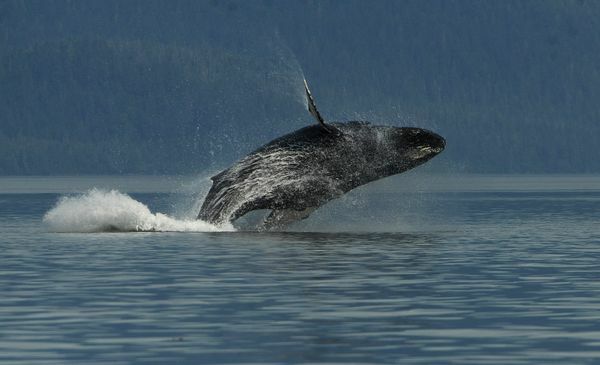 Information on the humpback whale is from the Alaska Department of Fish and Game website.